For almost every product, there is a polar opposite. I think it’s safe to say that the John’s Phone is the exact opposite of the iPhone/Blackberry Twitter-booking web browsing contraptions that the kids are using these days. 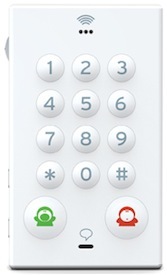 The John’s phone is simple to the point of minimalism, with no LCD display, just numbers and a send and an end button. The John’s Phone is available in white, pink, brown, black or green, works with just about any SIM you throw in it, and sells for €69.95 (about $89 US). I think it’s a bit too simple for my tastes — but at the very least, it makes a good snowpocalypse phone.